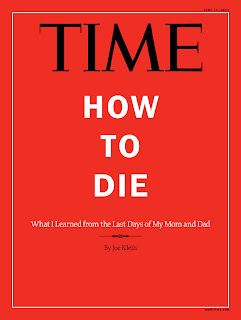 What does the How To Die cover of the current issue of Time says about the demographics of the magazine. This certainly wouldn’t be the cover of Vibe, Maxim, Esquire, Cosmopolitan or even the French magazine Paris Match for which the “companion” of France’s new president, Francois Hollande, Valerie Trierweiler, writes. 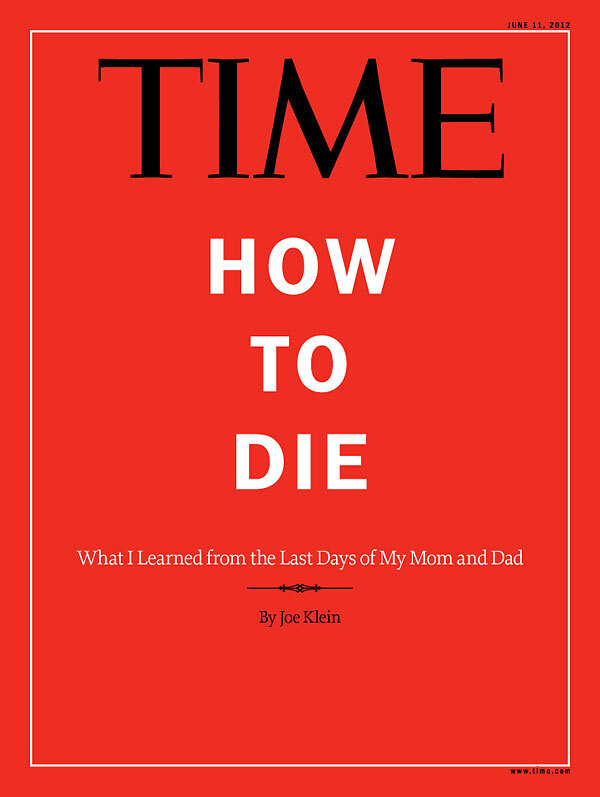 Time and Newsweek are the two struggling old war horses of American magazine journalism and one can't help asking if the subject of pulling the plug, that's the substance of Joe Klein's cover story ("How To Die: What I Learned from the Last Days of My Mom and Dad," Time, 6/11/12) isn't a double entendre. Who the hell reads these dinosaurs anyway? At very least, that's obviously a question advertisers are apparently asking, when you look at the current waif of an issue weighing in at a mere 66 pages. There are only so many dental offices in America. Time is plainly a magazine whose time has come. Did the editors even realize that the cover logo itself was oxymoronic considering the name of their magazine. Or perhaps they were just trying to recapture the glory of the controversial "Is God Dead" cover of yesteryear (Time, 4/8/66). You don’t want to know “how to die” if you have “time,” though if it’s your time then perhaps you’d want to know. Perhaps the red was just left over from some old cover story about the days of China’s infamous cultural revolution? The magazine business is more competitive than ever with art and editorial directors trying to do something, anything to stanch the flow of losses, but is fire engine red, bleeding to the edges, really the way to go considering the audience that the current issue of Time (and Klein's otherwise heartfelt and insightful piece) is reaching out to. The post menopause, Flomax crowd may be discussing their “arrangements,” but they don’t necessarily want to see blood.